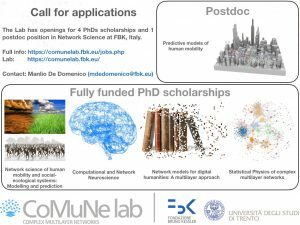 The Complex Multilayer Networks (CoMuNe) Lab is the Research Unit of Fondazione Bruno Kessler (FBK), placed in Povo (Trento, Italy), for modeling and analysis of complex and interconnected systems. Multilayer modeling often provides more insights than more traditional approaches, because they allow to naturally integrate available structural/relational/dynamical information. We use Network and Data Science to study structure, dynamics and resilience of real-world natural and artificial systems, from the human brain to society, at the edge of statistical physics, applied math and computer science. IMPORTANT: Please, be careful to apply explicitly for the corresponding reserved scholarship and that you satisfy the eligibility requirements. Reserved scholarships can only be assigned to those candidates who apply for and obtain the specific eligibility. The PhD positions will start from 1st November 2018. NOTE: Women and other underrepresented groups are strongly encouraged to apply to any available positions. Natural and artificial networked systems exhibit a high level of complexity, such as simultaneous relationships or interactions, temporal variations, interdependency. Top Research institute in Italy, ranked at the 1st place for scientific excellence within 3 different subject areas (ICT, History and Sociology) and for the economic and social impact according to the quality of research ANVUR evaluation for the period 2010-2014. Fondazione Bruno Kessler is a research non-profit public interest entity. Being the result of a history that is more than half a century old, through 2 scientific hubs, 7 research centers; 410 researchers; 100 PhD students from 25 countries; 220 between thesis-writing students, doctorate and post-doctorate students and visitng professors; 2 specialized libraries; 7 laboratories; FBK aims to results of excellence in science and technology with particular emphasis on interdisciplinary approaches and to the applicative dimension.